Years ago, when I started studying landscape design, I spent three hours every Friday morning for a year traipsing around the National Arboretum (and other places) learning about trees and shrubs. One chilly winter morning, my class was following our teacher down a winding road headed to a destination that now escapes me when we rounded a corner and there, in front of us, was a plant that stopped me in my tracks. It was Hamamelis x intermedia ‘Jelena,’ a hybrid witchhazel that sports fantastic orange, strap-like flowers in winter. Hamamelis x intermedia 'Jelena' at the National Arboretum stopped me in my tracks. When I took this photo, I was still shooting film and using a point-and-shoot camera. It’s not a great photo (too dark, even though I’ve worked on it in Photoshop), but when I got it back from Moto Photo, it entranced me and took me back to that overcast Friday morning. Later, when I scanned it, it became one of the very first images in the plant photo database that I now use in my design work, showing clients the plants I propose to include in their gardens. Since then, I’ve photographed witchhazels (‘Arnold’s Promise’ is another favorite) in other gardens, but ‘Jelena’ remains first in my heart and the photographer it helped to inspire is very grateful. 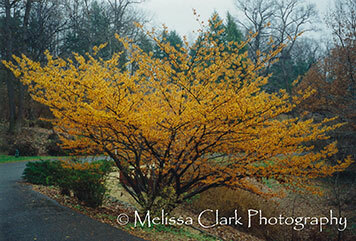 Witchhazel's strap-like blossoms appear in the winter when there is otherwise little color in the landscape. This entry was posted on January 28, 2010 at 1:00 am and is filed under landscape, photography. You can subscribe via RSS 2.0 feed to this post's comments. Jelena is gorgeous! I have Arnold’s promise and Diane, but that yellowy orange is just yummy. Lovely photos. Add her to your garden and you’ll have the three most beautiful witchhazels around. 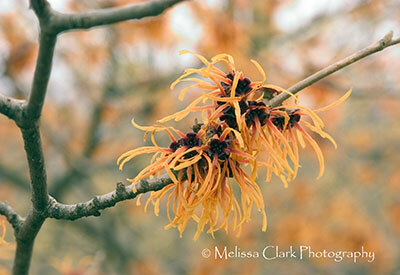 I don’t have a witchhazel in my own garden but hope to remedy that soon. Thanks for stopping by! I have enjoyed seeing other bloggers post about Witch Hazel. I am fascinated by the strap-like flowers and your photos are just beautiful. Thanks, Noelle. I should have added the information that these shrubs have really nicely-colored fall foliage so they are great autumn garden plants as well.